The program is located at the Camp Chief Hector YMCA (horse corral area). Travel west on Highway 1 (Trans-Canada Hwy.) approximately 75 km from Calgary city limits. Take the Rocky Mountain YMCA exit (exit number 114A). The exit is clearly marked with a green highway sign overhead. The road takes you across the highway to a STOP sign at a “T” intersection. 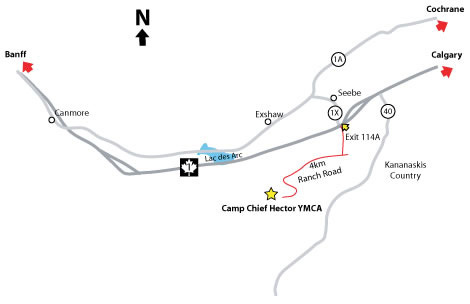 Turn right and follow Ranch Road West to the camp gate. From the camp gate follow YMCA Road to Bowfort Lodge and Bowfort parking lot. Hector Lodge parking lot is 2km further along the road. Travel east on Highway 1 (Trans-Canada Hwy.) approximately 25 km from Canmore. Take the Rocky Mountain YMCA exit. The exit is clearly marked with a green highway sign to your right. The road takes you to a STOP sign at a “T” intersection. Turn right and follow Ranch Road West to the camp gate. From the camp gate follow YMCA Road to Bowfort Lodge and Bowfort parking lot. Hector Lodge and parking is 2km further along the road. PLEASE NOTE: This map is just for directional purpose only. Do not contact them about the Rundle Riders programs.